It doesn't matter if you're a lawyer, a plumber, or a website designer, client relationships matter. In fact, so much so, that one bad review could greatly affect your current and future business. In the Digital Age where everyone has a keyboard and an opinion, it's best to build and maintain great customer relationships from the get-go. The Digital Age in some ways can also make businesses a tad distracted in terms of client relations. We may find ourselves getting overwhelmed by emails, content creation, and website management. But, clients still want to feel important and to feel valued. So, how can we keep up with our workload while making sure our clients feel like our number one priority? And, how can we make the most impact when connecting with our clients? 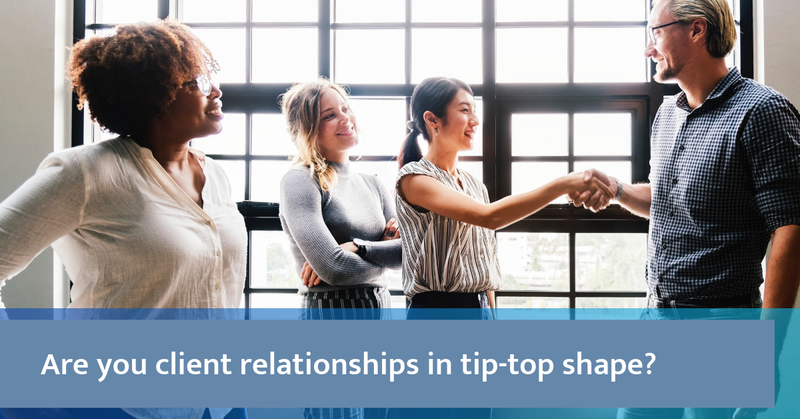 Read on to discover seven tips for improving business-client relationships to ensure your clients remain the foundation of your company. Relationships are a two-way street, but when it comes to client relationships you need to be the driving force. Don't wait for them to make the first move. Instead, take ownership of the relationship by reaching out on a regular basis. Your clients are busy just like you. But, when they don't hear from you they may start to believe that their business simply isn't important to you. They may also start to wonder what's going on with their project. Before any doubts about your client's importance start to arise, take action. Invite your clients in for a meeting or perhaps a short phone check-in to discuss their project. Just remember, it's your job to ensure your clients are happy. They can go elsewhere with their business, so you need to take charge of the relationship by showing them how important they truly are. It's important to be personable in every client relationship you have. This means being honest, transparent, and sympathetic to their needs. Not only as a business but also as human beings. Seek out exactly what your client needs. You might try asking, what one thing would they change so you might improve their experience? If you're able to fulfill these needs, then do so with a smile and a handshake. If you aren't able to meet their business needs then honestly tell them so while offering alternative solutions in a timely manner. You can also send them thank-you cards, fruit baskets, or even gift cards to their favorite restaurant. Whatever is in your budget make an effort and that your client would appreciate to let them know you value them and their business. Get organized and stick to a schedule of updating your clients on a regular basis. Provide them with a set of project deadlines and phases of each project. Let them know regularly where their projects stand as well. Not only does this let them know what you've been working on, but it also allows them to provide a report to higher-ups. Even if there isn't a major update, simply let them know that no changes ensued and what if any holdup might be. This can help to reduce miscommunication and frustration which could easily turn the client relationship sour. People learn and digest information in various ways. Even though the business world sometimes expects people to simply "keep up," this shouldn't be the attitude you take on with clients or even members of your team. Instead, offer clients a variety of ways to understand the information. Provide them with graphs, text, and in-person communication to make sure everyone is on the same page with some follow up. After a meeting, make sure to also send your client a list of takeaway points that occurred during the meeting. This will improve your client relationships by also having a point of reference should a miscommunication occur. So instead of circularly saying, "when we discussed this at the meeting," you can instead say "okay, let's look back on the meeting notes together so we're on the same page." One of the most important factors in improving client relationships is meeting deadlines. Your clients simply won't be impressed nor happy if their project falls behind. To avoid missing deadlines make sure to manage the project and people working on the project appropriately. Give yourself and your team enough time to meet the deadlines. When in doubt "underpromise and overdeliver." Even if your team may not need as much time as the deadline allows, your client will be pleasantly surprised when the project is completed early. Taking on this strategy will also ensure the work is not rushed and completed to meet or exceed their expectations. Treat their business like it's your own. Keep updated on their industry, competition, and company events. Be just as invested in their business as they are. You might consider offering referrals to them and for them. Always aim to provide continuing value to your clients. This means you should be focused not only on the project at hand but also on your client's future. For example, if you have a great idea your client would benefit from, then take the time to pitch it to them. They may say "no" but by pitching it to them, you're letting them know their business and its future is at the forefront of your mind. You're not just finishing a project for them, you're making sure their business flows more smoothly and is successful for years to come. Often times, we're frightened to ask our clients how we're doing. While it's difficult sometimes to hear constructive feedback, it's important to know exactly where we stand. Getting feedback is especially important because each client has different needs and expectations. So, before you have a client leave your business disgruntled, have the courage to ask how your company is doing and how you can improve your relationship with them. You should also ask your clients at the beginning of the relationship what their expectations are and how they communicate best. There are so many options for communications it’s important to know which one they prefer and for what type of notifications. In many industries, succeeding in client relationships means succeeding in business. While it's easy to get lost in the tasks involved in a project, always keep in mind that the client is your number one priority. Keep your client relationships strong and you can expect stellar reviews, more business, and more freedom to be trusted with further projects. Live in Chattanooga or want to provide the best office experience for your clients here? Book a meeting room for your next meeting and experience our services before you commit to a long term business location commitment. Check out our office space, when you schedule a tour to ensure your clients are impressed from the time they walk in the door.